The Human League Return To York Barbican! The Human League are an English electronic new wave band formed in Sheffield in 1977. Dare (1981), the band's most popular album, yielded the single "Don't You Want Me", a No. 1 hit in the pop charts of UK, US and many other countries. After its UK success, their first single, "Being Boiled", was reissued and became a top ten hit at the beginning of 1982. They received the Brit Award for Best British Breakthrough act in 1982. The success of "Don't You Want Me" is seen as the beginning of the MTV-driven Second British Invasion of the US. Other international hits include: "Love Action", "Open Your Heart", "Mirror Man", "Fascination", "The Lebanon", "Human" (a US No. 1) and "Tell Me When". 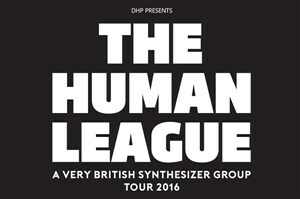 The Human League return to York Barbican on Dec 15th, tickets on sale this Friday.